This research was conducted with support from Japan Agency for Medical Research and Development (AMED) through the joint participation of Kiyoshi Kurokawa, Chairman of Health and Global Policy Institute, as research and development representative and co-researchers Hiroaki Yoshida, Vice Chairman of Health and Global Policy Institute, and Yoshiki Niimi, Assistant Professor of Fujita Health University, School of Medicine. This research program aims to propose the best possible way to establish International Public-Private Partnerships (PPP) that promote dementia research in an effective and efficient manner and to incorporate that into a concrete framework in Japan. It also aims to spread Japan’s knowledge so that international initiatives can be included in frameworks created abroad when they are proposed to related governmental entities and international organizations. In this report, three key approaches were identified that will enable Japan to establish an international PPP model. Firstly, the PPP must provide a platform for data collection and assessment that can facilitate discussion among organizations from various sectors including people with dementia, their families, healthcare facilities, government authorities, academia, private companies, and NPO/NGOs, etc. Secondly, efforts should be made to establish a high-quality dementia registry which can enable Japan’s participation in large-scale international clinical trials, and also to standardize and develop an effective and feasible evaluation framework for dementia care. Last but not least, the PPP should function as an organization that can raise awareness among the public on dementia and thereby promote understanding and acceptance, and further to demonstrate leadership in Asia as a society experiencing advanced aging. The promotion of a PPP for dementia policy will require not only cooperation between stakeholders and people with dementia and their families, but also mutual cooperation among stakeholders. Furthermore, people with dementia should not be positioned to only receive unilateral support; rather, we should aim to create a world in which those with dementia can also actively contribute to tackling the challenges dementia presents to society. Shown below is a vision of the dementia field and society of the future that the dementia PPP regime proposed by this research aims to realize. Focusing on the future, we need to set up a vision and mission and create a PPP roadmap. Develop research themes and activities based on the needs of people with dementia and their families. Appropriately prioritize research funding and activities based on an understanding of the issues surrounding dementia and evaluate the effects of research constantly. Enable all stakeholders to access and share data and knowledge from the dementia researches and related services. Encourage the private sector to invest actively in dementia policy and motivate further participation in this area. Actively adopt and utilize scientific and technical innovations for its work, including innovations related to ICT and robots. Solve latent social issues in Japan that are at the backdrop of dementia related problems (low birthrate and aging population issues; issues that women face, issues related to the need to leave jobs to take care of family members, etc.). Multifaceted and systematic solutions should be developed. In order for Japan to successfully manage the social challenges brought about by the long life expectancy of the Japanese people, and to demonstrate leadership in Asia as a country already experiencing population aging, we will establish a PPP platform on Dementia. Offer a space for stakeholders, including people with dementia and their families, to cooperate together, and to conduct discussions, evaluations, and inspections of dementia issues using objective data. Work to raise awareness and understanding of dementia in society, and to disseminate information internationally. Prioritize the development and objective evaluation of new technologies relating to dementia care. Strengthen the implementation base for clinical trials via initiatives such as the development of a registry to promote international cooperation, including participation in large-scale clinical trials. We conducted a survey of research projects and organizations related to dementia that make use of the PPP model, and on the representative organizations that are making progress in research on how to form PPPs. To develop improved methods for identifying the appropriate patient populations to participate in clinical trials. To standardize the methods used for conducting imaging scans and gathering and testing fluid samples To speed up the delivery of innovative therapies to those afflicted with Alzheimer’s by reducing the time and cost of Alzheimer’s disease (AD) clinical trials To transform the current model for developing new diagnostics and treatments by jointly identifying and validating promising biological targets for therapeutics Enable public and private funders of Alzheimer’s research to coordinate research planning, leverage resources, avoid duplication of funding efforts and identify new opportunities in promising areas of growth Promotes big data sharing among a federated, global network of data partners who are studying Alzheimer’s disease and other dementias. This research identified that the essential element of an effective PPP is clarity in organizational values, mission, and goals. Furthermore, those interviewed commented on the strong need for Japan to be involved in international research collaborations including those using the PPP model. To achieve this, it is important to strengthen the basic foundations of clinical trial research in Japan, including the practices by which participants and workers who can collaborate internationally are recruited. It is also crucial to secure stable funding streams to make all of this possible. In a study of fields that can be expected to be promoted by PPPs excluding drug discovery, we conducted interviews and other surveys with care and related service providers, local governments, town planning experts, robotics experts, and IoT researchers. We also conducted a survey of precedent cases of research promoted by PPPs on topics other than dementia and decided to use them as references for modeling the construction of a dementia PPP. Lack of support other than public services. Lack of understanding towards individuals with dementia from industry. The need of a society that is designed towards responding to people with dementia and that is comfortable for the entire ageing population. The desire for recognition that individuals with dementia are capable of supporting society rather than just needing support. The desire to adopt proven services and technology. The need of technology that reduces the burden on caregivers. The need of a long period, large sample, and generous funding to collect evidence and develop medicines needed for dementia treatment. The need of clinical research funding due to preclinical trial tests and medicines being exempt from health insurance. The difficulties of recruiting participants in preclinical trials (and the need for recruitment not only be done in clinics). The need of standardization in test procedures and diagnostic standards. The lack of infrastructure to give integrated support during large-scale multi-institutional joint studies. The difficulty in clearly presenting evidence of effects, and the cost effectiveness of doing so. The need to promote and disseminate services of reputable private services with verified effectiveness. The need of investments in private services and research plans in accordance with their societal achievements. The lack of communication between the research institutes and those in the field (such as at care facilities). The difficulty for effects to spread across regions, such as through the lateral development of efforts undertaken by local governments and NPOs. The need of collaboration between the community, social networks, and healthcare institutions. The need to effectively utilize data collected by the private sector. The need to have a clear, shared vision and mission across the various stakeholders. The need of neutral management that involves outside professionals while keeping conflicts of interest under consideration. The difficulty of covering the registry’s security and operational maintenance costs with annual public research expenditures. It is necessary to set clear goals to be achieved. These goals and the methods for achieving them should be differentiated from other efforts to avoid difficulties when fundraising. It is necessary to be transparent and independent so that the decision making process regarding project implementation and fund provider intent can be explained clearly. To make a sustainable business model, the it is necessary to involve fund providers who can eventually fund the model. It is possible that government and foundations bear the initial investment. The continuous promotion of the construction of evidence-based scientific programs is most important. A strong fundraising team and a communication team is required. As dementia has issues related to multiple fields (such as treatment, care to housing, and mobility), multi stakeholders should be involved in planning. If this is done, it will be necessary to make a continuous effort to create a unified sense of purpose among members. To develop the next generation of human resources, it is necessary to involve multiple generations. It is important to decide how to enable people with dementia and their families to actively participate in decision-making. Collaboration between the public and private sectors is required to raise awareness and educate the general public. Publicity campaigns with messages based on scientific knowledge are important in encouraging the correct understand of dementia within society. Organizations such as private insurance companies have conducted various investigations and research. A system that enabled the government to make use of their research findings would be useful. Evidence collected in each field should be shared as much as possible so that it may be utilized. There is no definite answer or system for formulating PPPs and long-term care providing systems. It should be of a design that enables bottom-up consideration of the culture of each country and region, with discussions between multi-stakeholders. As for the medical and nursing care fields, the private sector is easily influenced by changes in the government system. Therefore, a system that enables the private sector to collaborate with the government during the institutional design stage is necessary. Interviews identified the need for a PPP to facilitate knowledge sharing within the research community and to assess new technology. Also, interviews highlighted the importance of having a clear shared vision and mission within the PPP and of promoting transparency and impartiality in project management. After conducting interviews with stakeholders, it was revealed that they are highly interest in Japan’s expected role in the WDC and in other global policy planning endeavors. After sharing opinions with the WDC on this matter, the WDC decided to investigate the current situation and future topics in each field it focuses on. At only 0.2% of the total research fund, Japan’s investment into dementia research is the smallest among G7 countries. Therefore, Japan is expected to rapidly increase its investment into dementia research as well as to actively adopt a successful, revolutionary private and public collaboration model like the Dementia Discovery Fund (DDF). Continuing with the Pharmaceutical and Medical Device Agency (PMDA) as the main constituent, the Japanese government should form partnerships with regulatory authorities in each Asian country and establish itself as a leader in the region. Furthermore, the Ministry of Health, Labour and Welfare and insurers should make concrete proposals for drug prices and the extent to which insurance should cover dementia drugs. Policy direction should be decided after consulting with other countries to examine which approaches should be taken (for example, to look at drug evaluation methods). Japan should actively strengthen its partnerships with research centers in other countries. As one solution to this, AMED suggested participation in the Neurodegenerative Disease Research (JPND). Furthermore, the it is desirable that a platform which enables the sharing of various data is established. As a super ageing society, Japan should share best practices for dementia care and its experience with the world. It was pointed out that there are no examples of policies that involve society like the New Orange Plan. Japan is also getting attention for its utilization of ICT in treatment. The efforts of Dementia Friends in Japan can be greatly appreciated. In order to expand similar programs in other countries, the evaluation of related programs in Japan should be promoted. Japan should follow the risk reduction recommendations raised by the World Health Organization (WHO). In addition, since Japan is unique in that it has a super ageing society, it should actively conduct research related to identifying risk factors to delay the progression of the disease. This conversation allowed for opinions on the concept of the PPP model to be exchanged and it reaffirmed the need for an active Japanese contribution to the WDC. The conversation also stressed the importance of long-term strategic efforts for effective drug discovery and the standardization of care and evaluation methods. A multinational comparative analysis was carried out regarding the current status of international PPPs for dementia research. It identified elements and functions required for the cooperation between industry, government, and academia regarding dementia research in our country. According to the estimate for the number of patients with dementia in member nations of the Organization for Economic Co-operation and Development (OECD) reported in the Health at a Glance 2015 published by the OECD, the prevalence and future rate of growth in Japan is high. Western Europe and the Nordic countries mostly had high levels of dementia among the OECD member states, and countries such as Chili, South Korea, and Brazil were estimated to have high growth rates in the future. Although funding for the Government Budget Appropriations or Outlays on Research and Development (GBAORD) in Japan is around the same as countries excluding the United States and the United Kingdom, the amount of funding for dementia and neurodegenerative disease-related research and development is very low. The overall cost of dementia in Japan is 14.5 trillion yen (2014 estimation). The breakdown of costs reveals that the costs of nursing and informal care together account for a much larger proportion (87%) of total costs than medical treatment. 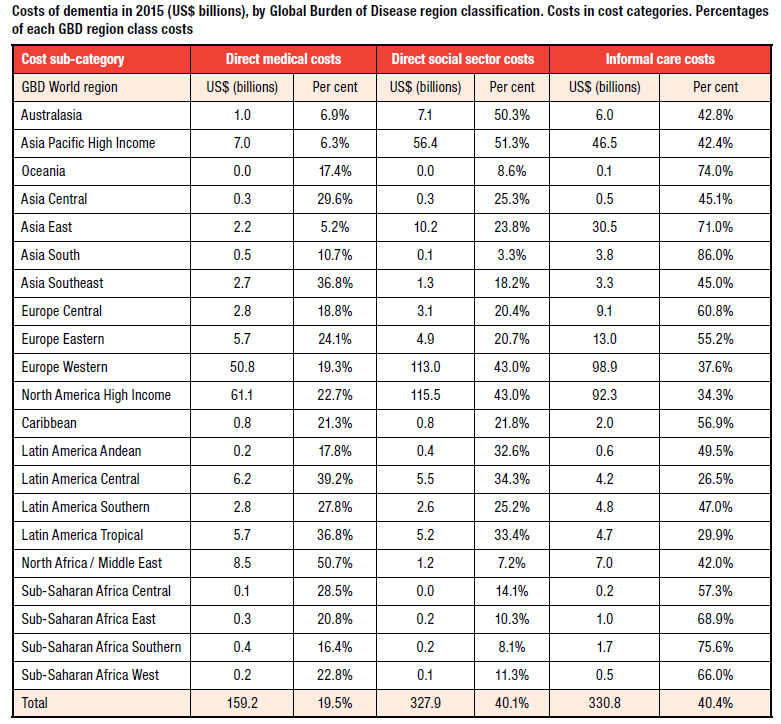 Regarding the dementia related cost ratio around the world, Asian countries have especially low medical costs, and Western countries often have high cost ratios for social centers. The United States signed the National Alzheimer’s Project Act (NAPA) into law as a national project on Alzheimer’s, while Britain and Japan have implemented policy measures as part of their national strategies. It is necessary for Japan to consider establishing basic laws in the future like the United States. Furthermore, Japan’s guidelines on clinical trials are inadequate compared to Western countries, and therefore their improvement will be a goal for the future. The results of this project emphasized the need for Japan to become involved in improving relevant guidance and guidelines for dementia, and the importance of developing a registry framework for clinical trials in order to further advance global collaborations on dementia research. *The contents of this page is based on the information as of March 2017 when we published our research results.